The script is so deeply ingrained that you don’t even need to think about it. When you do a favor, and someone says “thank you,” the automatic response is “you’re welcome.” It’s a basic rule of politeness, and it signals that you accept the expression of gratitude — or that you were happy to help. There are at least three potential advantages of this response. First, it conveys that we have the type of relationship where we can ask each other for favors and help each other without keeping score. Second, it communicates confidence that you’re the kind of person who’s willing to help others. Third, it activates the norm of reciprocity, making sure that you feel obligated to pay the favor back in the future. Although the logic is compelling, and I’m a longtime admirer of Cialdini’s work, I’ve never felt comfortable saying this phrase out loud. At first I thought I was too attached to politeness rules. How could I leave a “thank you” just hanging in the air without the proper acknowledgment? Awkward. It didn’t change my mind. The response still left a bad taste in my mouth. Eventually, I realized the problem was the subtle appeal to reciprocity. There’s nothing wrong with trading favors or asking others to repay the help you’ve given, but when I chose to help people, I wanted to do it without strings attached. I didn’t want to leave them feeling like they owed me. So I stuck with the familiar, banal “you’re welcome,” which was mildly dissatisfying. Why do we utter this strange phrase? In English, it’s a relatively new arrival. 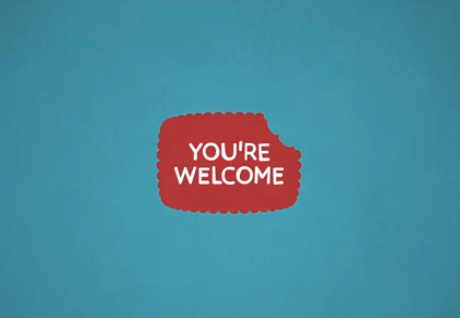 Over the past century, “you’re welcome” has evolved to connote that it’s my pleasure to help you or “you are welcome to my help,” which we tend to say more directly in other languages like Spanish and French (“the pleasure is mine,” “it was nothing,” “no problem”). Is there a better alternative? I stumbled upon an answer after meeting Adam Rifkin, a serial entrepreneur who was named Fortune‘s best networker. He goes out of his way to help a staggering number of people, doing countless five-minute favors — making introductions, giving feedback, and recommending and recognizing others. After Rifkin does you a favor, it’s common for him to reach out and ask for your help in return. At first, it seems like he’s just following the norm of reciprocity: since he helped you, you owe him. But there’s a twist: he doesn’t ask you to help him. Instead, he asks you to help him help someone else. Rifkin is more concerned about people paying it forward than paying it back. In his view, every favor that he does is an opportunity to encourage other people to act more generously. That way, a broader range of people can benefit from his contributions. After watching Rifkin in action, it dawned on me that Cialdini’s line could be adapted. Instead of “I know you’d do the same for me,” how about this response? Just like Cialdini’s reply, it affirms your character as a person who’s happy to be helpful. Unlike his version, it doesn’t deliver the implicit message that you’re indebted to me, and I’m waiting for you to repay it. So next time someone expresses appreciation for your help, it might be worth stretching beyond politeness to ask them to pay it forward. I know you’ll do that for someone else.